The 8th Word Wonder! 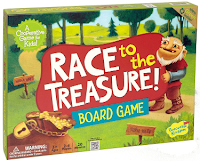 Speech & Language Therapy Blog: Game Review: Race to the Treasure! As evidenced from my many posts containing game reviews, I love to let students play board games during their Speech sessions! They are so great to work on social skills, especially turn-taking, sportsmanship, and coping with losing. In recent years, a trend of cooperative games has emerged in the board game industry. Cooperative board games basically require players to work together towards a common goal, rather than against each other. They foster teamwork and eliminate bragging (when a student wins) or temper tantrums (when a student loses). In a cooperative game everyone in the group either wins or loses. One of my favorite cooperative games to play during sessions is Race to the Treasure! by Peaceable Kingdom. Quick and easy to learn, it is appropriate for ages 5 and up and takes about 15 minutes to play. In addition, turns are quick, which makes it perfect for Speech sessions. The premise of the game is to build pathways in order to find three keys and “unlock” a treasure chest before the ogre reaches the treasure. Set-up: The game board consists of a grid, on which four key cards and an “ogre snack” card are randomly distributed. Game Play: On their turn, players pick a card from a pile. The card will have either an ogre picture or a piece of a road. If a player gets an ogre, he places it in the far right column of the board. If a player gets a piece of a road, he gets to place it on the grid. Players work together to build pathways leading to the keys on the game board. Once three keys have been reached, players win the game. However, if eight ogres are uncovered before the keys have been found, players lose. The “ogre snack”, a special tile, can be used to remove an ogre from the board. I have played this game with all grade levels (K-5), and they all thoroughly enjoyed this game. This game is great especially for younger players to work together when they can’t figure out how to best place a road tile to reach a key. I highly recommend this game! I found this game at my local Target, but of course it is also available on Amazon .